Today post follows the spirit of a pair of posts from spring 2016 and give you a head-start on the evolving business of 1950s Topps baseball sets. Feel free to check those out first. Modern card collectors will know Topps often revisits their past glory with Heritage sets, vintage reprints, throwback inserts, and so forth. 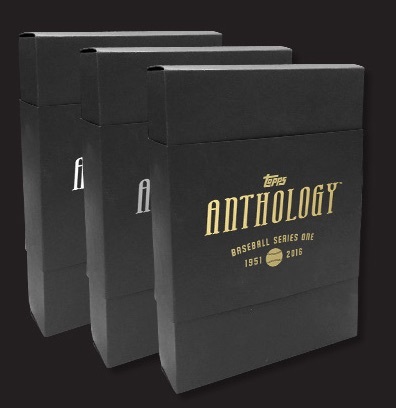 Back in 2016, Topps beefed up this tradition by releasing a Topps Anthology series that reprinted many significant baseball cards from their past on pricy, postcard-sized (5"x7") paper in boxed albums. 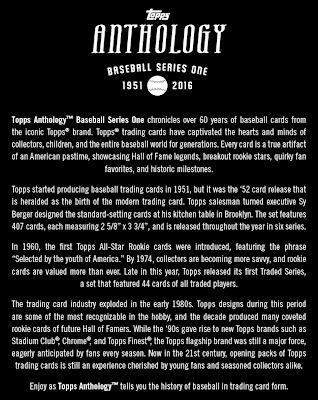 The marketing blurb accompanying Anthology gave me pause, as it mixed facts and errors in pursuit of a kitchen-to-castle story of Topps baseball and the collecting market in general. 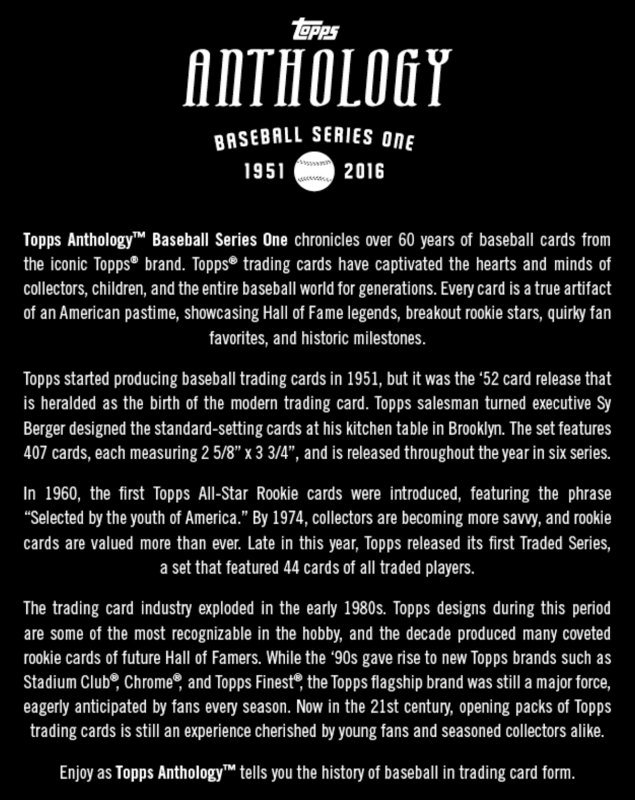 How well did Topps compact their decades of hobby history into two paragraphs? Not great. 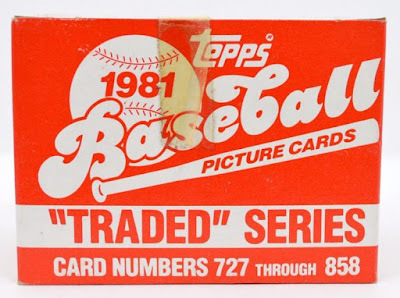 Error #1: "...started producing baseball trading cards in 1951..." is three years off. 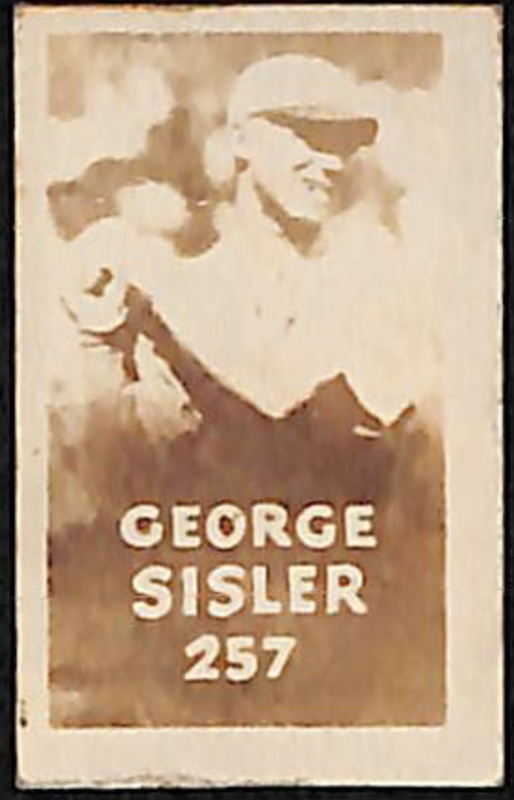 Topps first printed baseball cards in 1948 with the sepia-toned Magic Photo set. Today, you'll find type cards on eBay for low money, $10 or less. Magic Photo's gimmicky and ugly as sin, so I don't blame Topps for pretending they never happened. 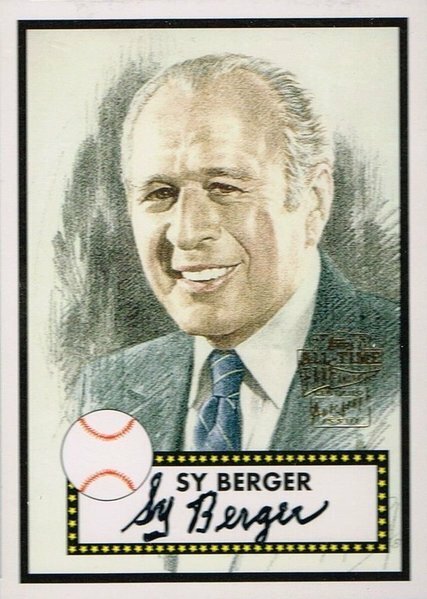 Fact: "...Sy Berger designed the standard-setting cards at his kitchen table..."
Sy Berger garnered a great deal of credit for creating the 1952 set and it sold well, forcing other card makers to play catch-up in both design and set size. Did Sy design this seminal set at his kitchen table? Sure, why not! I'm writing this post at my kitchen table. It's comfortable and it's where the food is. Error: "By '74...rookie cards are more valued than ever." That's somewhat true...and yet misleading. First-year rookies didn't drop in value before 1974, so their value was indeed "more than ever." Circa 1974, premium pricing in the hobby went to stars and rarity far more than prospects and rookies. That held true until cards like this came along. 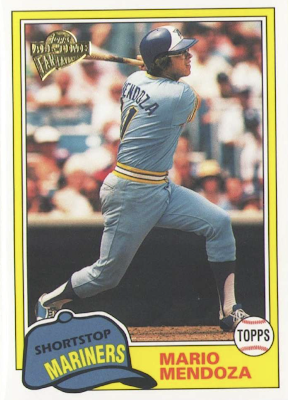 Unless my memory's faulty, the mania for rookies didn't blow up until Topps' competitors Fleer and Donruss arrived in 1981 and all three looked for ways to outsell and out-promote each other. 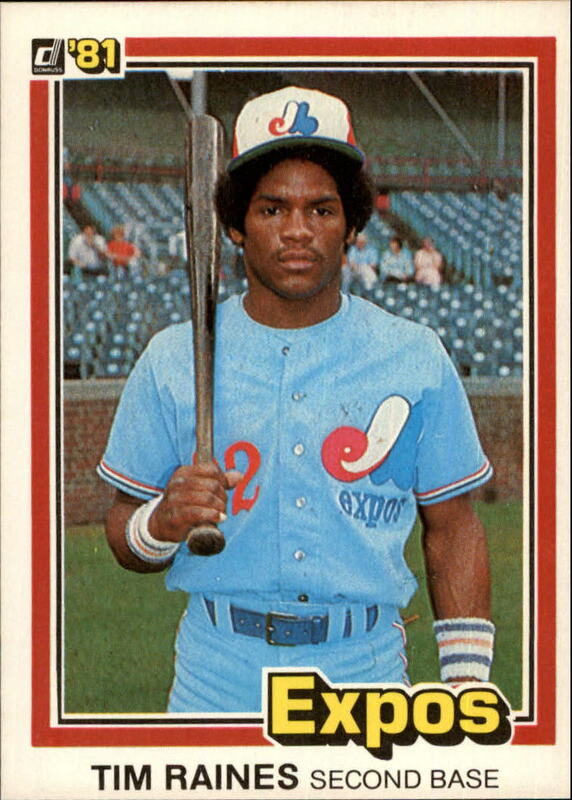 Tim Raines and Fernando Valenzuela drove high demand in 1981 itself, where Donruss was the only set to put Tim on his own card and Fleer was the only set for Fernando's own card. 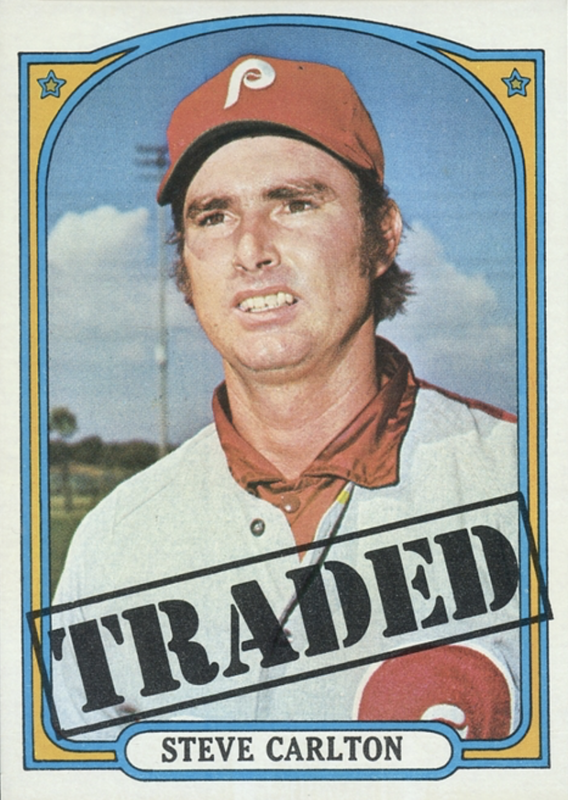 Error: "...first Traded series in late '74..."
Topps introduced Traded in their last series of 1972 baseball by airbrushing players into post-trade uniforms, like #751 Steve Carlton going from St. Louis to Philly. Why introduce this subset in 1972 and not sooner? I credit the early stages of MLB free agency, which promoted freer movement of players. Topps hoped these up-to-date cards sold during pennant races would give fans a reason to keep buying packs in the late season months. Error: "...stacking [1974 Traded] with rookies called up from the minors..."
Traded cards in 1974 feature airbrushed players who'd been traded, same as 1972. 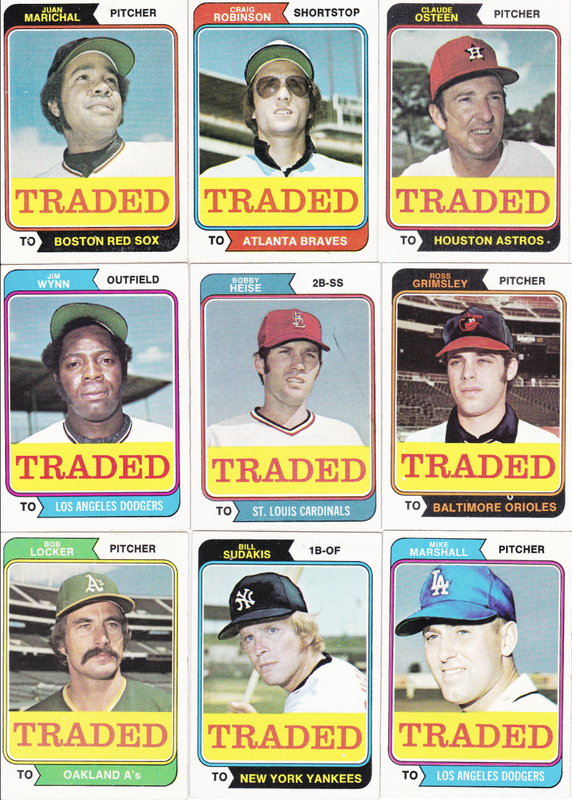 They did much the same with another Traded set in 1976. No rookies to be seen! If what you want is vets in new uniforms and rookie phenoms, Topps first offered that in 1981 as Topps "Traded," a tidy boxed set that added 132 cards to the existing regular set, #727-858. As mentioned earlier, this kind of release followed new competition from Fleer and Donruss. 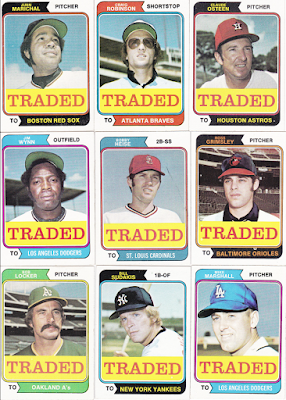 Before 1981, Topps took just three, low-quality shots at "traded" players in 1972, 1974, and 1976. Starting in 1981, they made the Traded series an appealing, annual look at fresh faces and new jerseys. 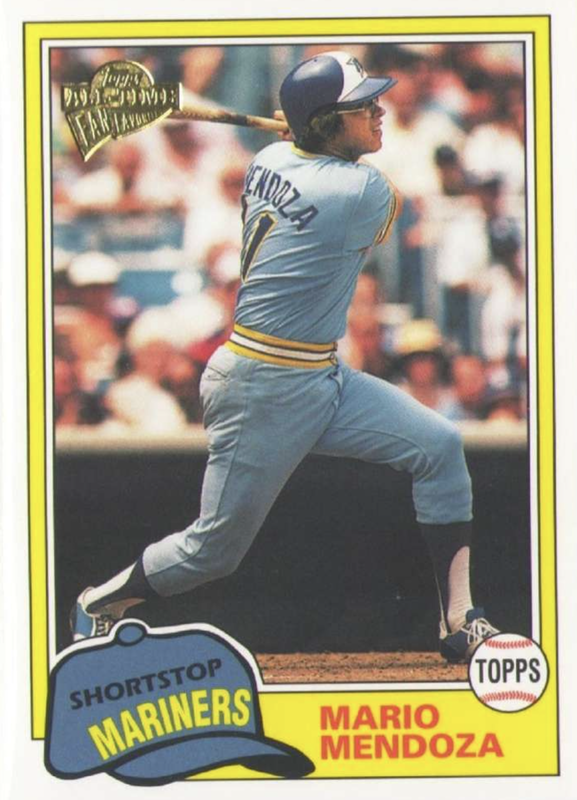 To tie back to my early note about Tim Raines and Fernando Valenzuela, one could argue they created 1981's Traded set as a hedge against innovations Fleer and Donruss would release and hot players they'd miss out on. How'd they measure up? Topps went 1-for-5 on their own history, batting just .200! I'm a little disappointed, given how easy it is to check these details via Google. Why do I care in the 21st century about how Topps characterized their first quarter century? Because there's a business history that runs parallel to their baseball history. The financial decisions that Topps made in those years enabled them to create all those great 1950s and 1960s cards that became part of Anthology and I want that business history to be just as visible to hobbyists, even if it risks making the baseball side feel less magical. And I'm not done with you yet, Anthology ad copy! For my next post, I'll dive deeper into the phrase, "Selected by the youth of America." Anthology didn't give us more to chew on and, as it turns out, there's plenty of meat on that bone. What should modern collectors know about who the "Youth of America" were? How does it relate to collecting today? More to come soon. 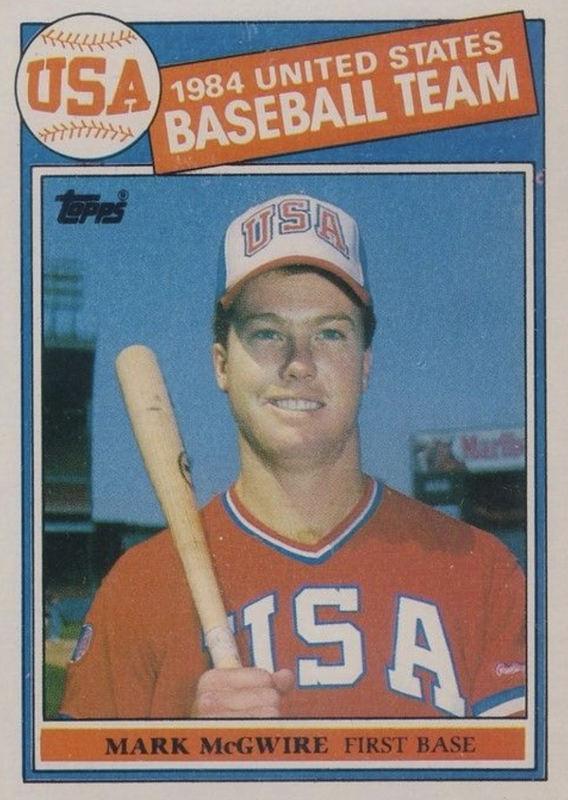 I will say that before Fleer and Donruss opened the market, there was definitely a sense in the hobby that rookie cards were especially important and valuable. Look at the Baseball Hobby News or Sports Collectors Digest issues from the time and you'll see that. Hi Brett, you're right rookies were prominent in the hobby, probably in all eras. In my experience, the modern hubbub for rookies and Rookie Cards kicked off around Topps, Fleer, and Donruss trying to get cards out first for Fernando, Tim Raines, Danny Ainge, Ripken, and other hot names in the early 1980s. Collectors had long, active conversations about which company had a rookie's "best RC," like 1981 Donruss for Tim Raines or 1981 Topps Traded for Fernando. You might remember pricing varied by other aspects of player performance, like MVP years, Cy Youngs. or the on-card All-Star banner. (Some price guides had notations like "MVP" and price bumps for that year.) Most of those faded away since. Rookie cards, though, are still with us!